When preparing for a conference, focus is often given to preparing written materials and visual presentations to ensure an enriching experience for participants. When some of those participants don’t speak the same language as the presenter, however, specialized services are needed. 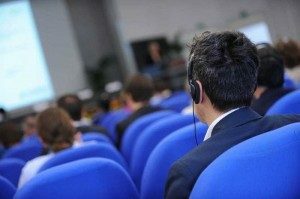 Translation Excellence can provide both the personnel and equipment to guarantee equal participation of all attendees, regardless of conference size or complexity. We offer top-of-the-line equipment, including FM 8 channel receivers, receiver headphones, interpreting booth, interpreter consoles, interpreter microphones, interpreter headsets, and both stationary and portable transmitters. For your next large gathering, our professional conference interpreters stand ready to help your presentation cross language and cultural barriers. In addition to being included as part of your conference interpretation, we will personally ensure all equipment is in good working order well in advance of your conference start time. To learn more about either our conference interpretation services or conference interpretation equipment, please click here for a free quote or call us at 720-325-0459 or toll-free at 877-409-6737.